MasterCard and Singapore Tourism Board (STB) announced a new campaign recently to entice Indian visitors traveling to Singapore. 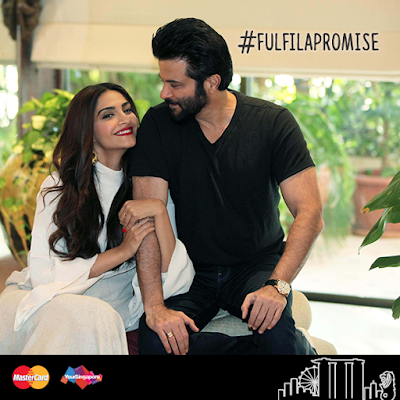 The initiative was launched through a new digital campaign #FulfilAPromise featuring Indian actors’ father-daughter duo Anil Kapoor and Sonam Kapoor. The MasterCard and STB cross-border campaign offers a chance to fulfil the promise of a holiday to your family by winning a grand prize of a trip for a family of four to Singapore. With this collaboration, MasterCard and Singapore Tourism Board will target Indian travelers exploring international destinations for their annual vacations and promote Singapore as a preferred travel destination this Holiday season. The recent MasterCard Asia Pacific Destinations Index (APDI) revealed that Asia Pacific cities have increasingly dominated as the fastest growing and most visited destinations in the world. Singapore was ranked the second top destination by arrival in Asia Pacific in terms of arrivals, total night stayed and in total expenditure. With Priceless Singapore, MasterCard aims to surprise and delight its Indian cardholders with exclusive experiences and privileged access, designed to be shared and enjoyed with the people who matter to them. MasterCard’s Priceless Singapore will connect people with their passions –shopping, travel, food and entertainment – and gives select access to a collection of exceptional experiences across the city. “India is an important growth market for us. Having seen a steady increase in tourist numbers from India over the last decade, we crossed the million mark in terms of Indian visitor arrivals in 2015. We want to continue to make every trip to Singapore a memorable one, and are excited to partner with MasterCard to provide exclusive privileges to Indian travelers to enhance the Singapore experience,” said Chang Chee Pey, Executive Director, Singapore Tourism Board. As part of the campaign, MasterCard invited its cardholders to submit entries on the MasterCard India and/or Singapore Tourism Board Facebook page by sharing their stories on the promises they have made to their families and how they would like to fulfill these promises in Singapore. The campaign will be held till May 6, 2016. One grand prize winner of the campaign will get a curated stay experience in Singapore and 10 minor reward winners will be awarded with a three night’s getaway in Singapore. The minor rewards will be announced for every week of the campaign period and a grand prize winner will be announced in the second week of May 2016. “As a kid, I remember how disappointed I felt when a much awaited vacation was cancelled due to my father’s busy schedule. The campaign will make the working parents realise that before it’s too late and you regret what you have missed with your family, it’s time to make each moment count and fulfil the promises you have made to the people you love.” said, Sonam Kapoor, Actress and Anil Kapoor’s daughter.